Take a barbecue road trip to Texas, South Carolina and Alabama. Explore Lexington, Memphis and Kansas City as well, along with recipes and wine pairings. Barbecue and beer. These two do the tango almost as famously as peanut butter and jelly. No matter what the style of barbecue, whether it’s a plate of Memphis ribs or a slab of Texas brisket, it matches up to near perfection with a cold pint. But what about serving a portion of sweet, Kansas City-style ribs with a carafe of wine? 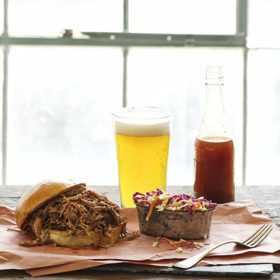 Or a chunked pork sandwich with a tangy, mustard-laced South Carolina sauce? Well, wine and barbecue pairing, though delightful when done well, can get tricky. This aromatic conundrum fuels debate among sommeliers who double as pit masters in their off hours. The debate can get quite heated, especially when it concerns styles of barbecue. Though grills and pits get fired up coast to coast, most devotees agree that there are six styles of barbecue. The big ones are eastern North Carolina, Lexington (North Carolina), South Carolina, Memphis, Kansas City and Texas. “These are very, very distinct styles,” says Fred Thompson, backyard pit master and author of Barbecue Nation. Eastern North Carolina is always the whole hog, and the sauce is made of vinegar, a little sugar and lots of crushed black and red peppers. The sauce is quite thin and very, very acidic. Lexington style (just pork shoulders and the sauce), called a dip, is different. “Basically, you take Eastern North Carolina sauce, and you add ketchup and sugar,” Thompson says. South Carolina barbecue uses either the whole hog or just the shoulders, but what makes it distinctive is its mustard-laden sauce. Though the sauce also contains ketchup and either honey or brown sugar, it isn’t a honey mustard. It’s hotter than that. This mouth-puckering sauce is heavy on the vinegar, and it’s meant to be tossed with pulled pork. It can also be used as a “mop” or basting sauce while smoking your pork. Thicker than eastern North Carolina-style, this sauce is called a “dip,” and it can be tossed with pulled pork or served on the side. In a medium bowl, whisk all the ingredients together until the sugar and salt dissolve. Use immediately or store in an airtight container in the refrigerator for up to a month. Shake before using. Makes about 3 cups. The sauce here is thicker and sweeter than in eastern North Carolina so Hendricks would select a Petite Sirah. Thompson’s sauce was inspired by his visits to Maurice Bessinger’s Piggie Park in West Columbia. Bessinger wouldn’t part with his secret recipe, but Thompson discerned the guidelines and came up with this version. Combine all ingredients in a medium-heavy saucepan over medium heat and cook, stirring, until the sugar dissolves. Remove from heat and let cool. Use immediately or store in an airtight container in the refrigerator for up to 2 weeks. Makes about 2 cups. Sugar and spice, this sauce is not so nice or easy for pairing, but something from the southern Italian region of Taurasi would work well. “It’s going to be very intense and rich, but also have good acidity to balance with the mop,” Hendricks says. Most Memphis-style ribs aren’t grilled “wet” (with the sauce), so if you’d prefer to make this a more traditional dish, just serve the sauce on the side, instead of basting the ribs during the last 30 minutes. Cut off and discard the flap of meat hanging off the bone of the spare ribs. Using the handle of a teaspoon or a screwdriver, slide the tip under the membrane covering the back of each rack. Lift and loosen the membrane until it breaks, then grab a corner of it with a paper towel and pull it off. Place the spare ribs in a large roasting pan or rimmed baking sheet and pour in the apple juice and lemon juice. Turn the spareribs over a few times to coat them evenly. Cover and refrigerate for 1 to 2 hours. In a medium bowl mix the rub ingredients. Remove the spare ribs from the refrigerator. Pour off and discard the apple and lemon juice mixture. Season the spare ribs all over with the rub. Cover and refrigerate for 2 to 4 hours. Remove the spare ribs from the refrigerator 1 hour before grilling. Prepare a smoker for 225˚F to 250˚F. Add 3 chunks of oak/apple wood to the burning charcoal briquettes. Brush the cooking grates clean. Put the spare ribs in the smoker, bone sides facing down, dividing them so they fit in a single layer on the two cooking grates. Cook them until they are done. This should take 5 to 6 hours. The meat will pull away from the ends of the bones by at least ¼ inch (often as much as 1 inch on some bones), and the meat will tear when you lift the racks on one end with tongs. While they cook, make the sauce. In a medium saucepan mix all of the sauce ingredients except the lemon juice. Place the saucepan over low heat and cook for about 20 minutes, stirring occasionally. Add the lemon juice and cook for 5 more minutes. Remove the saucepan from the heat. After about 3 hours of cooking, begin lightly spraying the spare ribs on the meaty sides with apple juice every 30 minutes or so. This will help them brown. If the ribs look like they are about to burn on either side, remove them from the grill (close the lid quickly to maintain the heat) and wrap them individually in aluminum foil. Then return them to the smoker. About 30 minutes before the spare ribs are finished cooking, lightly brush them on both sides with sauce. When the spare ribs are fully cooked and sauced, move them to a cutting board and let them rest for a few minutes. Then cut them into individual ribs. Serve warm with the remaining sauce on the side. Serves 6. In Memphis, the sauce is used more as an accent. A Washington Merlot would work nicely, try the Northstar 2007 Walla Walla Merlot.“It’s powerful and quite fruity yet it still retains quite a bit of acid,” Hendricks says. Combine all the ingredients in a medium-heavy saucepan over low heat. Stir and cook until the sugar and butter melt, and the sauce is well blended. Simmer, stirring frequently to prevent sticking and burning, for about 20 minutes. Use warm or cold. This will keep in the refrigerator in an airtight container for up to two weeks. Makes about 3½ cups sauce. The near-cloying sweetness of a Kansas City barbecue sauce necessitates an assertive wine. Hendricks suggests an intense Napa Valley Cabernet Sauvignon or Douro Valley red, like Quinta do Crasto. “They’re big and bold, spicy and really ripe,” Hendricks says. Nate Tilton, general manager at Fiorella’s Jack Stack Barbecue in Kansas City, recommends a Zinfandel or a Cabernet Sauvignon blend, like B Cellars Napa Valley Blend 25. “We just fell in love with this wine with our barbecue,” Tilton says. Though this rub is meant specifically for brisket, you can also use this on other cuts of beef. In a small bowl mix the ingredients. Makes about ½ cup. This quick barbecue sauce is meant to be paired with the Texas rub. In a small saucepan whisk the ingredients. Simmer over low heat for about 10 minutes to allow the sugar to fully dissolve and all of the flavors to blend, stirring occasionally. Makes about ¾ cup. “Well, Texas is always about subtlety,” Hendricks says, tongue-in-cheek. “One wine that works particularly well with Texas barbecue is Tempranillo.” Hendricks particularly recommends Texas winemakers McPherson Cellars and Innwood Estates. “They’re rich and juicy and really quite nice,” Hendricks says. Alabama-style barbecue is a world of its own. It’s usually chicken slathered with a mayonnaise-based sauce. Mince the onion and garlic until they are almost a paste. In a medium saucepan over medium heat, melt the butter. Add the onion and garlic, and cook until the mixture is opaque, 2 to 3 minutes, stirring occasionally. Add the white wine. Mix well and cook until half of the liquid has evaporated, 2 to 3 minutes, stirring occasionally. Remove the pan from the heat and let cool for about 5 minutes. Whisk in the remaining sauce ingredients. The sauce should have the consistency of ranch dressing. Cover and refrigerate until about 1 hour before serving. Fill a charcoal grill starter (like the Weber RapidFire chimney starter) to the rim with charcoal and burn the charcoal until it is lightly covered with ash. Spread the charcoal in a tightly packed, single layer across one-half of the charcoal grate of the grill. Put the cooking grate in place, close the lid, and let the charcoal burn down to medium heat. Leave all the vents open. Let the chicken sit at room temperature for 20 to 30 minutes before grilling. Lightly coat the chicken on all sides with the oil. Season evenly with salt and pepper. Brush the cooking grate clean. Grill the chicken over indirect medium heat, with the lid closed as much as possible, until the juices run clear and the meat is opaque all the way to the bone, 30 to 40 minutes, turning occasionally and swapping their positions as needed for even cooking. During the last 5 to 10 minutes of cooking, lightly brush the chicken with some of the sauce. Serve warm with more sauce on the side. Store the remaining sauce in the refrigerator for as long as 2 weeks. Serves 4-6. This is a really unique sauce that needs some acid to cut through the fat of the mayonnaise, so Hendricks suggests a grand cru Chablis, such as Joseph Drouhin 2008 Domaine Drouhin-Vaudon Vadésir. “You don’t often get to recommend a Chablis with any other type of barbecue, but this really works,” Hendricks says. This sauce can be used with ribs or pork, but it is especially good on chicken or fish. In a medium sized bowl, mix all ingredients together. Makes about 2½ cups. Smoke, alcohol and sugar…these ingredients can ruin many wines. Hendricks suggests a Domaine Zind-Humbrecht Pinot Gris from Alsace. “It’s got some residual sugar, but there’s still some power to stand up to the sauce,” Hendricks says.